On August 7th, 1968, the Beatles returned to Abbey Road's EMI Studios for two separate recording sessions of songs for possible inclusion on "The White Album". 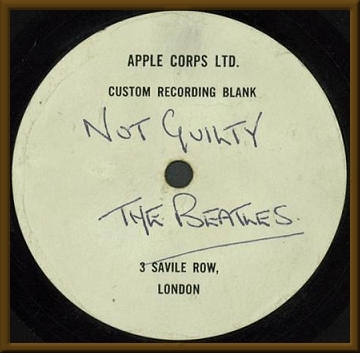 The longest of these two sessions turned into a 3-night event during which they recorded over 100 takes of a new George Harrison composition entitled "Not Guilty" (though not all takes were completed). However, it was eventually decided not to issue this song on "The White Album" (George later re-recorded this song for his 1979 George Harrison album). This acetate is a mono mix and slightly longer version than the stereo track that appeared in 1996 on the Beatles' Anthology 3 album. The extra length is due to a fake ending (the track fades to almost quiet, then restarts before a final fade out). Label VG++, Disc G-, Plays VG-.